• Whether blowing a spry jig or “Amazing Grace”, Mr. Balderose showed a virtuoso’s gift for careful shading. • On behalf of our newly commissioned officers of the Navy and Marine Corps team we thank you for making our Naval ROTC commissioning Ceremony so very special by your piping while marching our Midshipmen to center stage. You are truly a very talented musician. I might add that our great Mayor of Pittsburgh, The Honorable Tom Murphy, commented that you are known as the “best of Pittsburgh!” I concur wholeheartedly! I hope you would consider piping for us again at next year’s Naval ROTC Commissioning Ceremony. -Sincerely and Yours Aye, J. Randall Stapleford, Captain, United States Navy, Carnegie Mellon University NROTC. 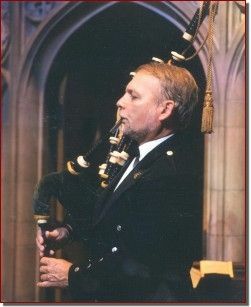 • I didn't know the bagpipes were so versatile! George Balderose is quite an artist, and his music is wonderful! 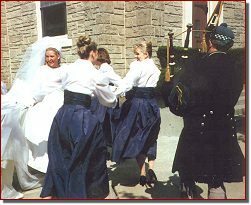 • Your bagpipe music was the highlight of the wedding for my daughter, for us, and for her new family. It was just gorgeous! • Thank you for the wonderful music you brought to our daughter’s wedding. I’ve never heard the pipes sound better! 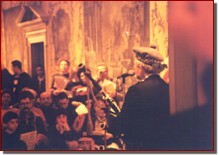 • The cast includes a fine bagpiper, George Balderose. -Donald Miller, Pittsburgh Post-Gazette, PA.
• I would like to tell you how much I enjoyed your performance. It was a lovely evening and your piping was the highlight. -Elizabeth Cookson, Winchester-Thurston School, Pittsburgh, PA.
• We were extremely impressed by the authenticity of your costumes and your music and the overall quality of your performance. 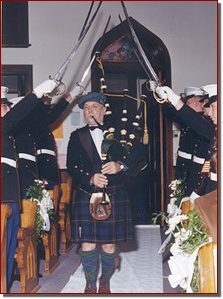 Your piping was of the highest caliber… The audience found the presentation to be not only extremely entertaining-but also educational-which added to the charm of the entire program. -Linda Rutter, Cultural Committee for the Borough of Roaring Spring, PA.
-Don and Nancy Souders, Leechburg, PA.
• I want to thank you for your wonderful perfomance at our First Fridays concert. Your magnificent piping added tremendously to the excitement of the evening. 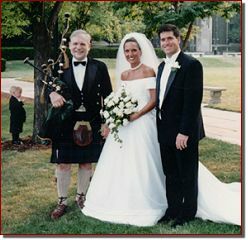 -Susan Petrie, The Frick Art & Historical Center, Pittsburgh, PA.
• Your piping always contributes to the wonderful joy of our commencement celebration. -Michele Colvard, Assistant Dean, Chatham College, Pittsburgh, PA.